Broomstick lace is a really old technique, which may originally have actually been done with a broomstick but is now usually worked with a giant knitting needle and a crochet hook. 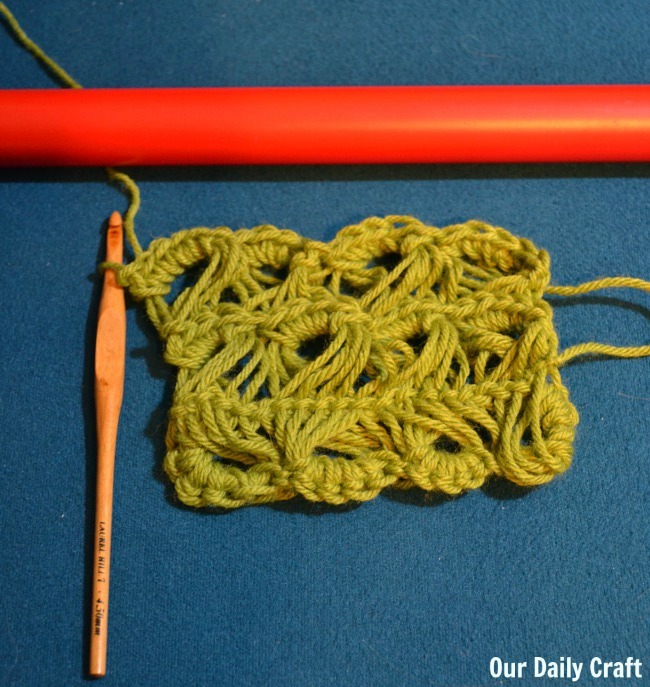 You form loops on the knitting needle with the help of the hook, then work the loops together into crochet stitches. It makes this loopy, lacy, really interesting fabric that isn’t like results you’d get with either standard knitting or crochet (though there are ways to fake it, the original method is nicer, if you ask me). 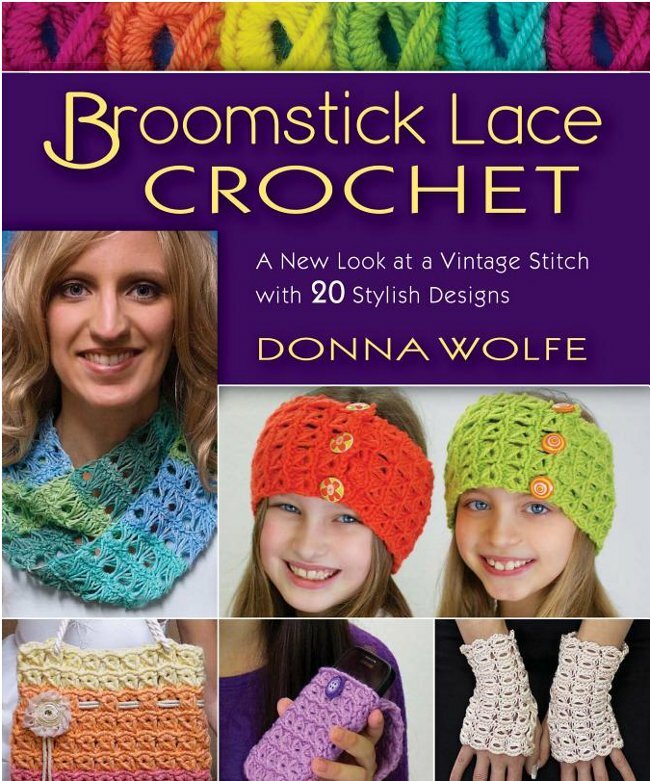 Though I’ve done a lot of fiber crafts before, I’d never tried broomstick lace until I read Broomstick Lace Crochet: A New Look at a Vintage Stitch, with 20 Stylish Designs by Donna Wolfe. (So you know, this book was published by the publisher of my last two books, but of course all opinions are my own). 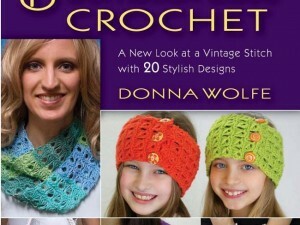 The book opens with detailed step-by-step instructions on how to form the basic stitches, as well as increasing and decreasing in the stitch pattern. It’s perfect for people who have never tried the technique before, and after a few tries I was able to make a little swatch. It was really fun to try and I’m thinking about making a little shawl with the pattern to try it out further. The book, of course, has lots of great patterns, most of which are designed for people new to the stitch. Projects that are more complex often use the stitch as a border or embellishment rather than an allover design. There’s a basic scarf/infinity scarf to start people off, then a pillow cover, boot cuffs and a tote bag using the stitch. Baby items including a sweater, hat and booties are embellished with the stitch. Other projects include an evening bag, headbands that can double as little cowls, a small triangular scarf, a larger wrap, a blanket and a curtain, among other projects. The stitch is also used on the top of a tutu dress for a little girl, which I’m sure my little girl would love. It’s billed as a ballerina dress but reminds me more of a mermaid. If you’re looking to add a new technique to your arsenal this year, broomstick lace is an interesting one that produces a fabric that’s eye-catching and quite unlike other methods. It’s a little awkward getting started, like anything, but once you try it you’re sure to want to check out some of these patterns and make a few items using this strange but classic technique. Have you ever worked broomstick lace, or did your grandmother? I’d love to hear anything you know about this craft!